As the opening of Zooming into Focus: Contemporary Chinese Photography and Video from the Haudenschild Collection at its final venue the National Gallery in Beijing draws near, it is time to pause and reflect on the exhibition's significance. Since its inaugural showing in 2003, at the University Art Gallery, the San Diego State University (U.S.A.), the exhibition has traveled to the Shanghai Art Museum (China), the Centro Cultural Tijuana (Mexico), the Institute of Contemporary Arts (Singapore) and, now, the National Gallery in Beijing (China). During these two years, interest in contemporary Chinese photography and video has mushroomed. When Eloisa and Chris Haudenschild began collecting, only specialists in the field had heard of the young artists whose works so fascinated the Haudenschilds. Now, many of those same artists are in very high demand for international exhibitions and important collections. The Haudenschilds were prescient in their focus, driven by Eloisa's enthusiasm, and guided by Lorenz Helbling, director of ShanghART in Shanghai. Two years ago, Chinese photography and video was poised on the brink, its sheer energy, mass and quality readying it for launch into an international presence. Just last year, the major exhibition, Between Past and Future: New Photography and Video from China (2004),[i] did much to promote Chinese photography and video, with a touring schedule that includes New York, Chicago, Seattle, Berlin, and Santa Barbara. Yang Fudong's nomination for a Hugo Boss Prize in 2004 signified that the international art arena was ready to seriously consider new media artists from China. In 2005, Oxford University Press added entries on three Chinese video artists to the online reference work, Grove Art Online. 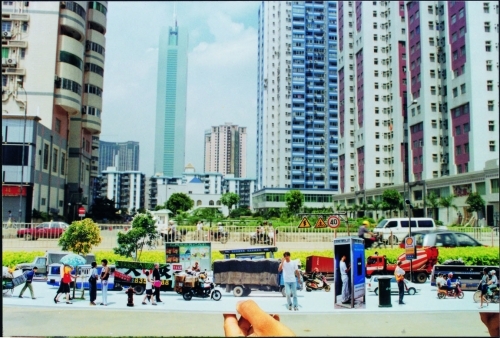 [ii] Clearly, Chinese photography and video has come of age since Zooming into Focus first opened in 2003. As the exhibition of a private collection, Zooming into Focus has had a certain nimbleness and allure. Representing a personal vision, it has not been expected to present a complete or historic view of the field. Nevertheless, it has captured a major slice of Chinese photography and video, representative of a signal moment. Private collections are well suited to capturing the life of a vibrant art movement, driven as they are by passion, unencumbered by institutional impedimenta. The Haudenschilds' enthusiasm for the field extends beyond collecting: as part of the overall Zooming into Focus program, they have commissioned new works (not necessarily collectible), have sponsored lectures and video screenings, and have supported two symposia focusing on contemporary Chinese photography and video, in San Diego and Hangzhou. Because Zooming into Focus has been exhibited in diverse parts of the globe, its significance shifting with place and time, I have asked people close to the collection and to the exhibition for their thoughts on what Zooming into Focus has meant. [i] Co-organized by the Smart Museum, University of Chicago and the International Center of Photography, New York, in collaboration with the Museum of Contemporary Art, Chicago and the Asia Society, New York; curated by Wu Hung and Christopher Phillips. [ii] Britta Erickson, Biographical entries on Song Dong, Yang Fudong, Zhang Peili, Grove Art Online, Oxford University Press, September 2005.